J&S was in attendance alongside U.S. Army Corps of Engineers Officials for the ceremony to recognize the LEED Gold Certified Ft. Campbell Equipment Maintenance and Supply Complex, located in Fort Campbell, Ky. This complex consists of six new buildings as well as additions to two existing structures, which total over 49,000 square feet of construction. Two of these buildings are LEED Gold Certified and are the first LEED Certified buildings at Fort Campbell, one of America's largest Army bases. These facilities also mark the first LEED Gold Certification for the U.S. Army Corps of Engineers Louisville District. This project was a collaboration between the U.S. Army Corps of Engineers and J&S Construction Company's Design/Build team, which was comprised of Orchard, Hiltz & McCliment Architecture, Stansell Electric, CHC Mechanical and TKO Fire Protection. "A LEED building or green building is one that focuses on fuel efficiency, on water efficiency, on all these efficiencies," said Mohammed Ibrahim, SOCOM Fort Campbell's resident engineer, with the Louisville District U.S. Army Corps of Engineers. "A lot of it has to do with water use, electricity use...energy performance for the building, using HVAC systems that optimize energy use." The team integrated sustainable features from all LEED categories including sustainable sites, water efficiency, energy and atmosphere, materials and resources and indoor environmental quality. Project highlights included a projected water use reduction of over 40%, a projected energy use reduction of 49%, over 75% of construction waste diverted from landfills, over 20% of building products being incorporated from recycled content, as well as an increased indoor air quality during construction and pre-occupancy. "We were able to exceed the Corps of Engineers' requirements for the project, provide LEED Gold Certified buildings, and reduce the building's life cycle costs," said Brad Leimer, project manager and LEED AP BD+C at J&S Construction. "By designing the project to the LEED standards in the beginning, we were able to keep our price competitive with the typical building." It's good because Fort Campbell, just like the whole nation, needs to focus on green energy," Ibrahim added. "This is just one step for the Army in that direction. You save a lot of money when you are efficient in electricity use and water use." 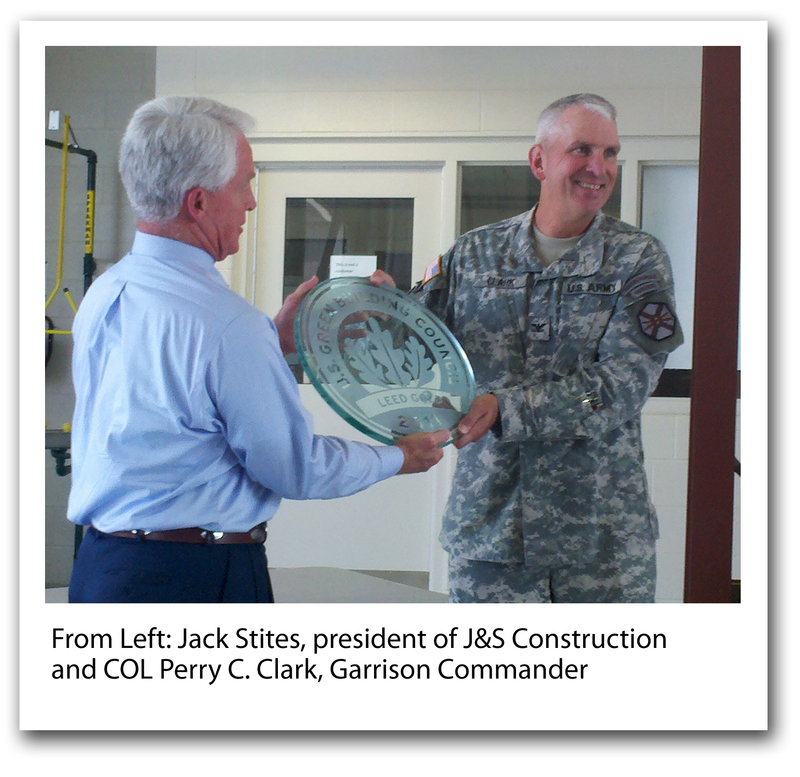 J&S Construction is the first contractor in the state of Tennessee to complete a LEED Silver, LEED Gold and LEED Platinum building and has designed and built over 129,000 square feet of LEED Certified buildings. Two of J&S' projects were also recently noted in Memphis Business Journal's "The List: Tennessee LEED Certified Spaces." The General Service Administration's Census Field Office, completed by J&S Construction in 2010, and certified as the state's first LEED Platinum facility was recorded as the No. 1 LEED Certified space in the state. The project ranked above high profile facilities such as the FedEx Express World Headquarters (Memphis), BlueCross BlueShield of Tennessee Corporate Headquarters (Chattanooga), The Pinnacle at Symphony Place (Nashville) and Caterpillar Financial Center (Nashville). J&S Construction's corporate headquarters, Freedom Plaza, also notched at No. 24 on the list. The 24,000 square-foot facility was the first Class "A" Office Space in the State of Tennessee to be LEED Gold Certified. J&S recently broke ground on its newest LEED project, Stones River Manor, a faith-based, not-for-profit senior living community located in Murfreesboro, Tenn. J&S will be responsible for the design and construction of an 8,000 square-foot, nine-unit, independent living apartment building which aims for LEED Silver Certification. If you have any questions about green construction practices or design-build construction, contact J&S Construction at 931-528-7475. To see Memphis Business Journal's "The List: Tennessee LEED Certified Spaces," please click here.